Refinishing of hardwood floor is a good option to bring a new and fresh look to the existing floor. It is a good alternative to complete replacement of a floor. All solid hardwood and some engineered floors can be refinished. Why not all engineered hardwood floors can be refinished? The answer is because they have a few layers of wood and actual top or wearing layer supposes to be thick enough for sanding. Usually high quality engineered hardwood floors can be sanded a few times, but some of the low end products cannot be refinished at all. 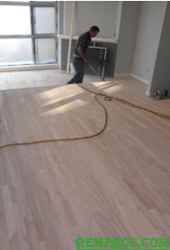 The process of refinishing is very similar to finishing of a new unfinished hardwood floor. It includes complete sanding and applying a finish on a bare wood. Scratches and dents will be eliminated from the surface, but some big damages might be requiring additional repair. Floor color can be easily changed by applying a colored stain. Before it was a very dusty process, but now dustless techniques allow sanding with minimal dust and people even can live in the house while some rooms are in the process of refinishing hardwood floor. There is another option to refinish the hardwood floor using a liquid sander method. In another words it is an application of liquid which contains chemicals for penetration into the existing finish. Ones its applied there is a waiting period after which the floor needs to be wiped. This method not eliminates any scratches, dents or other defects on the surface it just allow the new finish penetrate into the wood. Cost to refinish hardwood flooring significantly lower in comparison to replacement, but with professionally performed work it will look as a new again. If the floor in a good shape and without deep scratches, buffing and recoating is an alternative to make the floor looks fresh. It is a cost effective process, but do not expect much from that. The same like with a liquid sander method, scratches or deep dents will not be eliminated as well as spots from deep penetrating materials such as paint. Buffing and recoating just help maintain floor in a good condition and prevent from refinishing in the future. Learn how to sand hardwood floor.